I wanted a tattoo really badly and I was thinking, a mantra would be best because Buddhism is a part of me and will never leave and change. 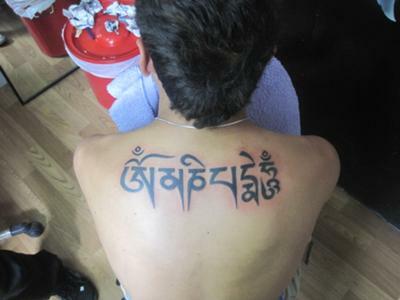 Om Mani Padme Hum was the first that came into mind, but I wanted something different due to it being popular. I asked my guru, Lama Zopa Rinpoche what mantra would be best. and he replied by saying Om Mani Padme Hum. From then I knew that was the one to get. After researching into the meaning a bit. I found out that it also has a connection to my name. My name Karuna, meaning compassion. I am really happy with it and it means a lot to me.